Some folks have big plans for your future. They want you—a burger-eatin’, chicken-finger-dippin’ American—to buy their burgers and nuggets grown from stem cells. One day, meat eaters and vegans might even share their hypothetical burger. That burger will be delicious, environmentally friendly, and be indistinguishable from a regular burger. And they assure you the meat will be real meat, just not ground from slaughtered animals. That future is on the minds of a cadre of Silicon Valley startup founders and at least one nonprofit in the world of cultured meat. Some are sure it will heal the environmental woes caused by American agriculture while protecting the welfare of farm animals. But these future foods’ promises are hypothetical, with many claims based on a futurist optimism in line with Silicon Valley’s startup culture. Cultured meat is still in its research and development phase and must overcome massive hurdles before hitting market. A consumer-ready product does not yet exist and its progress is heavily shrouded by intellectual property claims and sensationalist press. Today, cultured meat is a lot of hype and no consumer product. “Much of what happens in the world of cultured meat is done for the sake of PR,” Ben Wurgaft, an MIT-based post-doctoral researcher writing a book on cultured meat, told Gizmodo. Wurgaft finds it hard to believe many predictions about cultured meat’s future, including the promise of an FDA-approved consumer product within a year. “We have a food system that isn’t working, people are eating food that degrade their body, a billion go to bed hungry every night,” Josh Tetrick, CEO of the controversial food company Hampton Creek, told Gizmodo. He proposed that all these crises could be solved “with plants” but since “people love meat,” cultured meat can help. The problem is real: Meat consumption continues to increase, and could increase by “4 percent per person over the next ten years,” according to Ensia reporting. Livestock represent approximately 15 percent of man-made greenhouse gas emissions, according to the Food and Agriculture Organization of the United Nations. But first, startups need to actually launch the consumer product, which means overcoming critical production and distribution challenges before even thinking about selling it as a reasonable, affordable alternative to slaughtered meat. “The important point is that no one has done this at scale yet.” Existing cost estimates relying on prototypes “are based on existing extrapolation of lab-scale processes that aren’t just unsustainable, but also not an accurate representation of what this would look like,” Eitan Fischer, director of Cellular Agriculture at Hampton Creek told Gizmodo. For now, we know that the meat is made by growing animal-derived cells in the lab and harvesting the meat after a month or so. Part of that scale-up includes developing industrial bioreactors for growing the meat—eventually, cultured meat producers hope the process will look a lot like the beer brewing, where cells grow in big tanks. (Bioreactors as large as 20,000 liters exist for other purposes, but would need to be designed specifically for growing cow, chicken or pig cells.) Companies are mum about their progress on these bioreactors. Hampton Creek told Gizmodo that they had a bioreactor and explained how the scale-up might work, but would not give details on the size. And yet, cultured meat startups love bringing up slaughtered meat’s greenhouse gas emissions. “With plants providing nutrients for animal cells to grow, we believe we can produce meat and seafood that is over 10x more efficient than the world’s highest volume slaughterhouse (a 1,000,000-square foot facility in Tar Heel, N.C.). All this without confining or slaughtering a single animal and with a fraction of the greenhouse gas emissions and water use,” Hampton Creek CEO Josh Tetrick wrote on a LinkedIn post this past June. But despite what you may have heard, the evidence as to whether cultured meat is better for the environment is inconclusive. “On the environmental studies, the work that’s been done is very preliminary,” Hampton Creek’s Fischer said. A 2011 study estimated that the product might produce fewer greenhouse gas emissions, but use about the same amount of energy as the European pork industry. One 2015 study found potential environmental benefits in China, but another 2015 estimate found it could use just as much energy as animal-based meats. The common theme is uncertainty. It seems that the very idea that cultured meat will be better for the environment than slaughtered meat doesn’t just require new means of food production, it requires the world around it to change in order to sustain it—for the products to be made and shipped predominantly with renewable energy, for example. When Memphis Meats discusses the environmental benefits on its website, given the inconclusive data, these claims seem reliant on optimism. “When people tell stories about cultured meat one of the things they do is quickly fill in blanks on the page around the meat,” said Wurgaft. He thinks that some stakeholders treat cultured meat as an object on which they can hang other hypotheticals about the future. 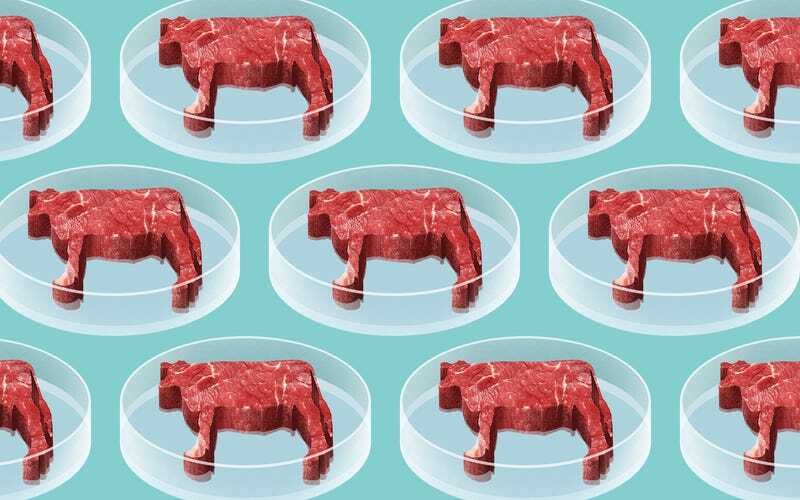 As far as cultured meat’s other big promise—meat without murder—it is also uncertain. The most talked-about hurdle in slaughter-free meat production is how to feed the cells. The agricultural industry treats cows like little factories: plants consume solar energy, cows consume plants, cows turn solar energy into energy consumable by humans. Like cows, cells grown in a culture must be fed too. The most prevalent option is a serum made from the blood of calf fetuses called fetal bovine serum—clearly not a vegan or slaughter-free option. Expensive and proprietary replacements exist as Good Food Institute senior scientist Liz Specht showed me, but every cultured meat company’s Holy Grail is an affordable serum without animal products. Despite our inability to truly assess the current state of cultured meat, press coverage alone would make you think that the future will be “full of lab-grown meat.” I am just as guilty as the rest for fueling the hype. Today, estimates for the launch of the first consumer product range from Hampton Creek’s 2018 claim to Memphis Meat’s 2021 claim. Many industry observers think these dates are overly optimistic, though this could depend on the initial price. But oversell in coverage isn’t new—in interviews with Gizmodo, at least three different commentators cited Alexis Madrigal’s 2013 chart in The Atlantic. It demonstrates that predicted dates on plenty of estimates for when in vitro meat would hit the shelves have passed. Industry observers not involved in the startups are skeptical for lots of different reasons. Several, in interviews with Gizmodo, said that waves of speculation prevented productive conversation about how this never-before-eaten food would be scaled and regulated by the FDA, and how it would evolve. Datar also thought it surprising to apply West Coast Silicon Valley startup thinking to the traditional middle-America meat world. Tetrick from Hampton Creek told Gizmodo that the company entered the cultured meat space because he wanted to reduce industrially-produced meat consumption in Trump country. Aren’t these regions already distrustful of the liberal coastal elite? Why would they buy this liberal meat? This is a small industry making huge promises about what the future of meat will look like. Of course, startups need to make lofty promises (and hit goals) so they may continue to be funded. But in this case, we don’t know whether the solution they’re offering will actually be the best. Still, overly positive press and ethical optimism can make us dream of a world that doesn’t yet exist, where all meat is brewed in a bioreactor, instead of a future where we pursue other options that solve the problems of industrial agriculture. It’s exciting that a version of the future feels like it’s around the corner, but folks have been writing about lab-grown meet since at least 2003, without a commercial product to show for it. It doesn’t exist yet, at least not in a way that you, a consumer, can eat it.